We describe here a technique that combines transposon mutagenesis with high-throughput sequencing to identify and quantify transposon leptospiral mutants in tissues after a challenge of hamsters. This protocol can be used to screen mutants for survival and dissemination in animals and can also be applied to in vitro studies. Lourdault, K., Matsunaga, J., Evangelista, K. V., Haake, D. A. High-throughput Parallel Sequencing to Measure Fitness of Leptospira interrogans Transposon Insertion Mutants During Golden Syrian Hamster Infection. J. Vis. Exp. (130), e56442, doi:10.3791/56442 (2017). In this manuscript, we describe a transposon sequencing (Tn-Seq) technique to identify and quantify Leptospira interrogans mutants altered in fitness during infection of Golden Syrian hamsters. Tn-Seq combines random transposon mutagenesis with the power of high-throughput sequencing technology. Animals are challenged with a pool of transposon mutants (input pool), followed by harvesting of blood and tissues a few days later to identify and quantify the number of mutants in each organ (output pools). The output pools are compared to the input pool to evaluate the in vivo fitness of each mutant. This approach enables screening of a large pool of mutants in a limited number of animals. With minor modifications, this protocol can be performed with any animal model of leptospirosis, reservoir host models such as rats and acute infection models such as hamsters, as well as in vitro studies. Tn-Seq provides a powerful tool to screen for mutants with in vivo and in vitro fitness defects. Identification of virulence genes for some bacteria, such as Leptospira spp., is difficult because of the limited number of genetic tools available. One commonly used approach is the creation of a collection of mutants by random transposon mutagenesis followed by the identification of the insertion site in each mutant and virulence testing of individual transposon mutants in an animal model. This approach is time-consuming, expensive, and requires a large number of animals. When random mutagenesis was first developed for the pathogen Leptospira interrogans, genes involved in virulence were identified by testing individual mutants in an animal model1. Mutants were selected based on criteria such as their potential roles in signaling or motility or their predicted outer membrane or surface location. As the majority of leptospiral genes encode hypothetical proteins of unknown function2, selecting mutants based on these criteria limits the ability to discover novel leptospiral virulence genes. More recently, pools of L. interrogans transposon mutants were screened for infectivity in the hamster and mouse models3. Each animal was challenged with a pool of up to 10 mutants. Infectivity of a mutant was scored as positive if it was detected by PCR of cultures obtained from blood and kidney. PCR testing was laborious because it required an individual PCR reaction for each mutant in the pool. Because the frequency of each mutant in the cultures was not quantified, the approach was biased towards identification of highly attenuated mutants. We describe a transposon sequencing (Tn-Seq) technique, as a strategy to more efficiently screen for virulence genes. Tn-seq consists of the creation of a library of mutants by transposon mutagenesis followed by massive parallel sequencing4,5,6. Briefly, transposon mutants are pooled, inoculated into animals, and later recovered from different organs (output pools). The DNA from the output pools is extracted and digested with restriction enzymes or sheared by sonication. Two rounds of PCR targeting the junctions of the transposon insertion sites are performed. This step enables the addition of the adaptors necessary for the sequencing. The resulting PCR products are analyzed by high-throughput sequencing to identify the transposon insertion site of each mutant of the pool along with their relative abundance, which is compared to the initial composition of the pool of mutant. The primary advantage of this approach is the ability to simultaneously screen a large number of mutants with a small number of animals. Tn-Seq does not require the prior knowledge of the transposon insertion sites which increases the chances of discovering new Leptospira-specific genes involved in virulence with less time and greater efficiency. Because leptospiral burden in tissues is relatively high in rodent models susceptible to lethal infection (typically 104 to 108 bacteria/g of tissue)7,8,9 as well as in reservoir hosts10,11, tissues can be directly analyzed without the need to culture, reducing biases due to in vitro growth. In Tn-Seq studies with most bacterial pathogens described to date, the high frequency of insertional mutagenesis allowed infection with large pools containing mutants collectively having multiple closely-spaced transposon insertions within every gene4,12,13,14. Tn-Seq has also been developed for a bacterium for which the mutagenesis frequency is much lower6. With Leptospira, a library of transposon mutants can be generated by introducing the transposon on a mobilizable plasmid by conjugation as described by Slamti et al15. However, the frequency of transposon mutagenesis of L. interrogans is low. When the Himar1 transposon was introduced on a conjugative plasmid, the transconjugant frequency was reported to be only 8.5 x 10-8 per recipient cell with the Lai strain of L. interrogans16 and is likely to be similarly poor with most other strains of L. interrogans. The protocol described here is in part based on that developed for Borrelia burgdorferi, in which the frequency of transposon insertional mutagenesis is also low6. For our pilot experiment with the protocol17, we conducted transposon mutagenesis with L. interrogans serovar Manilae strain L495 because of the success of other groups in isolating transposon insertion mutants in the strain along with its low LD50 (lethal dose) for virulence1. We screened 42 mutants by Tn-Seq and identified several mutant candidates defective in virulence, including two with insertions in a candidate adenylate cyclase gene. Individual testing of the two mutants in hamsters confirmed that they were deficient in virulence17. CAUTION: Pathogenic strains of Leptospira spp. must be handled under Biosafety Level 2 (BSL-2) containment procedures. Appropriate personal protective equipment (PPE) must be worn. A Class II biosafety cabinet must be used for all manipulations of pathogenic Leptospira spp. 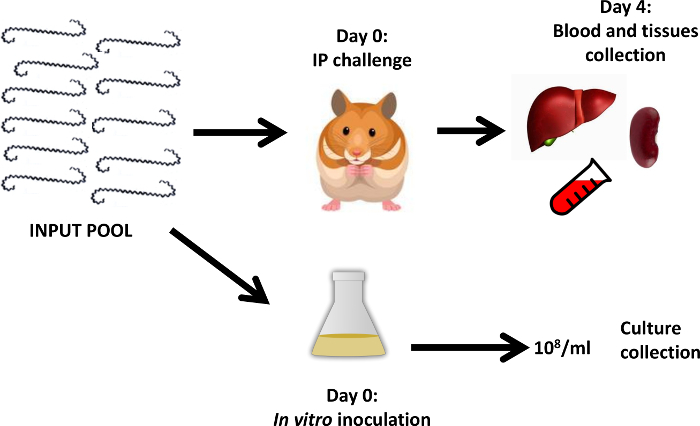 Inoculate a volume of exponential-phase culture of pathogenic Leptospira spp. corresponding to 107 cells into 10 mL of Ellinghausen-McCullough-Johnson-Harris medium (EMJH)18,19. Incubate at 30 °C with 150 rpm shaking until the density reaches 2 - 8 x 108 cells/mL. NOTE: The doubling time of pathogenic leptospires is 12 to 24 h, depending on the strain. Inoculate 50 µL of the donor Escherichia coli strain β216320 carrying the mobilizable transposon plasmid (pCjTKS2)16 into 5 mL of Luria Broth (LB) supplemented with 0.3 mM of 2,6-diaminopimelicacid (DAP), 50 µg/mL of kanamycin (Km), and 50 µg/mL of spectinomycin (Spc) and place overnight in a 37 °C incubator at 255 rpm. Inoculate 60 µL of E. coli cells into 3 mL of EMJH supplemented with 0.3 mM of DAP (EMJH+DAP). Incubate at 37 °C at 255 rpm agitation for 3 - 4 h up to an OD600nm≈ 0.3. To assemble the filtration unit (Figure 1), place the base on a 125 mL side-arm Erlenmeyer flask, position an acetate-cellulose filter (pore size 0.1 mm; diameter 25 mm) on the base, and clamp the funnel onto the base. Connect the filtration unit to a vacuum system. Add 5 mL of Leptospira spp. culture and 0.5 mL of E. coli culture into the funnel.Vacuum the liquid through the filter. Transfer the filter with the surface of bacteria facing up onto an EMJH+DAPplate. Incubate at 30 °C overnight with the filter facing up. Place the filter into a 15 mL tube containing 1 mL of EMJH and vortex for 10 s to release the bacteria into the media. Spread 200 µL of the suspension onto 5 EMJH platescontaining 50 µg/mL of Km using 10-15 1 mm sterile glass beads or a sterile disposable spreader. Wrap the plates with parafilm and incubate them upside down at 30 °C for 3 to 4 weeks until colonies are visible. Transfer colonies individually into 3 mL of EMJH containing 50 µg/mL of Km (EMJH+Km) at 30°C under 150 rpm agitation for 7 to 10 days until the culture reaches a density of ≈ 108/mL. NOTE: Cultures can be stored at -80 °C or in liquid nitrogen (with 4% glycerol). Lyse 50 µL of each transposon mutant in PCR tubes by incubation at 95 °C for 15 min. NOTE: DNA can be purified instead, using a DNA extraction kit. Prepare the PCR mix with Deg1 and Tnk1 primers (Table 3) according to Table 1. Transfer 23.7 µL of the mix to each PCR tube and add 1.3 µL of lysed cells. Run the program: 95°C for 5 min; 40 cycles: 95 °C for 15 s, 40 °C for 1 min, 72 °C for 2 min; 72 °C for 10 min. Make the PCR mix with Tag and TnkN1 primers (Table 3) according to Table 2. Transfer 24.2 µL of the mix to each PCR tube and add 0.8 µL of PCR #1 reaction. Run the program: 95 °C for 5 min; 35 cycles: 95 °C for 15 s, 55 °C for 30 s, 72 °C for 2 min; 72 °C for 10 min. 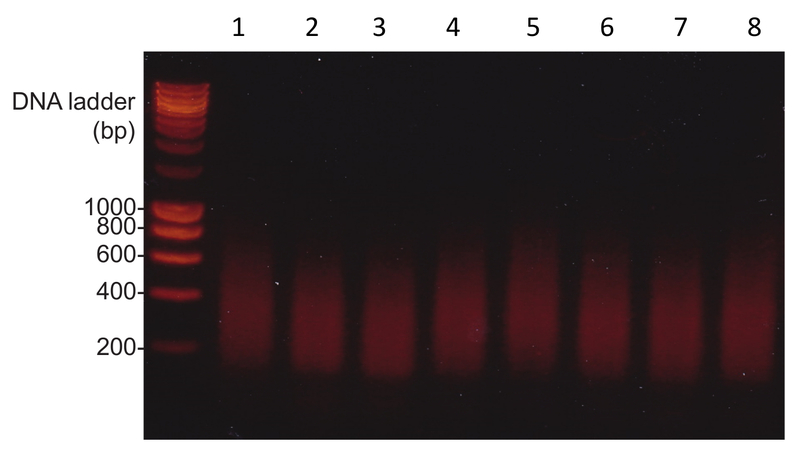 Run 3 µL of PCR products on a 1% agarose gel with 1X Tris-Acetate-EDTA (TAE) buffer at 10-15 V/cm (Figure 2B). Purify PCR products of positive samples using a PCR purification kit. Elute DNA with the lowest volume allowed by the kit to maximize the concentration of DNA recovered. Send purified PCR products for Sanger sequencing using the TnkN1 primer (Table 3). Identify the insertion sites by comparing the resulting sequence with the parental strain's genome sequence by BLASTN analysis (http://blast.ncbi.nlm.nih.gov/) or using the SpiroScope database (http://www.genoscope.cns.fr/agc/mage)21. Confirm the insertion site of the transposon by PCR using primers annealing to the flanking host sequences. NOTE: The transposon increases the size of the wild-type sequence by ≈ 2 kb. Grow individually each selected transposon mutant in 10 mL of EMJH+Km at 30 °C at 150 rpm agitation to a density of 107-108 leptospires/mL. Count the leptospires by dark-field microscopy with a Petroff-Hausser counter or as described by Miller23. Dilute each culture in EMJH to the same density, for instance 106 cells/mL. To assemble the input pool, mix together the diluted cultures in equal volumes. NOTE: Include controls in the input pool by adding mutants with known fitness defects such as loa2217,24 and mutants with unaltered fitness such as ligB17,25, respectively. Pools of mutants can be stored with 4% glycerol at -80 °C or in liquid nitrogen. NOTE: The methods described here were approved by the Veterans Affairs Greater Los Angeles Institutional Animal Care and Use Committee (protocol #09018-14). Inject intraperitoneally 1 mL of the input pool to each animal with an insulin syringe U-100 with 26G x ½" needle. NOTE: In the pilot experiment, 8 animals were challenged with 1 mL of the input pool, i.e., 106 bacteria total17. The infection was allowed to proceed for 4 days prior to euthanasia. Collect 10 mL of the input pool, and spin for 20 min at 3,220 x g. Carefully remove the supernatant without disturbing the pellet. Store the cell pellet at -80˚C until use (step 3.1.3). Monitor the animals daily until they are terminated at the pre-determined endpoint. Weigh the hamsters daily and look for endpoint criteria: loss of appetite, gait or breathing difficulty, prostration, ruffled fur, or loss of > 10% of the maximum weight attained. On the day of challenge, inoculate 3 flasks of 25 mL of EMJH+Km with 5 mL of the input pool. Grow cultures at 30 °C under 150 rpm agitation. Count the leptospires daily by using one of the methods of section 2.1.2. When the density reaches ≈ 1 x 108/mL, spin down each suspension for 20 min at 3,220 x g.
Store the cell pellets at -80 °C until use. Euthanize the animals by isoflurane inhalation followed by bilateral thoracotomy26. Immediately collect 1 to 2 mL of blood by cardiac puncture with a 3 mL syringe and a 25G x 5/8" needle. Transfer the blood into tube containing EDTA. Mix by inversion, 5 to 6 times. Collect one kidney and ⅓ to ½ of the ventral median lobe of the liver into cryotubes. Store tissues at -80 °C until use. Transfer 100 µL of blood from the EDTA tube to a microcentrifuge tube. Purify DNA using a DNA extraction kit. Follow the manufacturer's instructions. 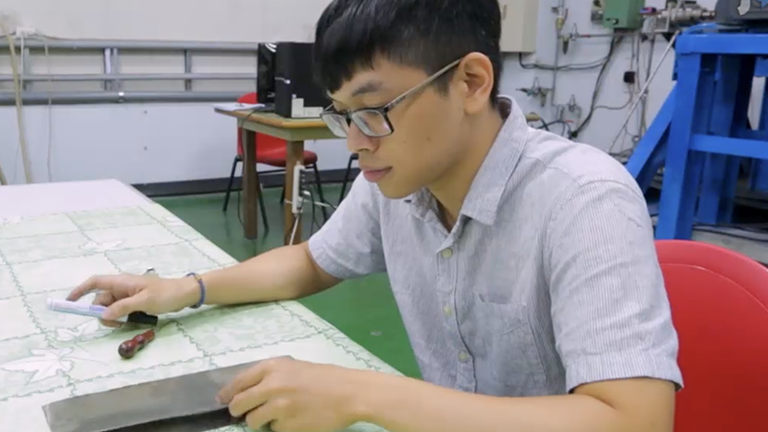 Using scalpels and scissors, dice between 50 to 80 mg of each organ into small pieces (1 mm x 1 mm), and transfer them into a sterile screw-cap dry tube. Measure the weight of tissue with a precision balance. Add 500 µL of sterile PBS into the tube. Homogenize samples by using the disruptor for 1 min at 5 movements per second. Transfer the calculated volume into the DNA extraction kit. Proceed with DNA purification following the manufacturer's instructions. DNA extraction from the input pool and in vitro cultures. Thaw bacterial pellets at room temperature for 5-10 min. Proceed with DNA extraction following the instructions accompanying the kit. Store DNA at -80 °C until use. Transfer 50 µL of extracted DNA onto a 1.5 mL microcentrifuge tube. Place the tubes into the rack of the sonicator cup horn filled with cold water (4 °C). Run the sonicator for 3 min at 80% intensity with 10 s on pulse and 5 s off pulse. CAUTION: Wear ear muffs or ear plugs to protect hearing. Run 2.5 µL of the sheared DNA on a 2% agarose gel to confirm that most of the DNA is <600 bp in size. Measure DNA concentration with a small volume spectrophotometer. Prepare tailing reaction (Table 4). Incubate 1 h at 37 °C; inactivate at 75 °C for 20 min. NOTE: For samples that require adjustment to a volume greater than 14.5 µL, increase the final volume of reaction to 40 µL and scale up the remaining components accordingly. Clean the samples with a PCR purification kit. Elute the DNA with 12 µL of elution buffer. Prepare PCR mixes according to Tables 3 and 5. Transfer 22 µL of the library mix to each PCR tube and add 3 µL of purified DNA. Proceed similarly with the control mix. NOTE: Primer TnkN317 is specific to the transposon and primer olj3766 is specific to the C-tail. The control mix is lacking the TnkN3 primer, which specifically targets the transposon. Run the following program: 95 °C for 2 min; 24 cycles: 95 °C for 30 s, 60 °C for 30 s, 72 °C for 2 min; 72 °C for 2 min. Prepare the second PCR mixes according to Tables 3 and 6. Transfer 49 µL of the library mix to each PCR tube and add 1 µL of PCR #1 library reaction. Transfer 24.5 µL of the control mix to each PCR tube and add 0.5 µL of PCR #1 control reaction. NOTE: Primer pMargent2 is specific to the transposon, and the IP primers6 contain six-base-pair barcode and specific sequences recognized by the next-generation sequencing platform. Run the following program: 95 °C for 2 min; 18 cycles: 95 °C for 30 s, 60 °C for 30 s, 72 °C for 2 min; 72 °C for 2 min. Run 3 µL on a 2% agarose gel. The library should show a smear with the majority of the signal between 200 to 600 bp (Figure 6) and no amplification for the control reaction. NOTE: Clean the genomic libraries with a PCR purification kit following the manufacturer's instructions. Elute the DNA with 30 µL of elution buffer. Measure the DNA concentration using a fluorometer. Average 2 to 3 reads. CAUTION: DNA concentration and volume requirements depend on the sequencing platform. Sequence libraries as 64 bp single-end reads using the custom sequencing primer pMargent3 and the standard commercial sequencing primer. The sequencing platform will provide you FastQ files with all sequencing reads. In the SpiroScope database homepage (see step 1.2.7 for link), select the organism used for the experiment and click "LOAD INTO GENOME BROWSER". In the toolbar (near the top of the homepage), select "Search/Export > Download data", in the "Sequence (fasta)" line, click "Genome" to download the sequence. Open the file with Notepad (PC) or TextEdit (Mac) and rename the chromosome (for example "ChrI"). Maintain the fasta format. Follow the same steps to download the sequence of chromosome II. Combine both chromosome sequences into a single .txt file by copying and pasting. NOTE: Chromosome sequences can also be downloaded from the NCBI website (https://www.ncbi.nlm.nih.gov) and combined into a single .txt file. NOTE: Galaxy is an open source, web-based platform for managing data intensive bioinformatics workflows27,28,29,30 and can be accessed at https://usegalaxy.org/. In the Tools menu, select "Get data > Upload File from your computer". Drag and drop the .fastq file(s) generated by the sequencing platform into the window then click "Start". Follow the same steps to upload the Leptospira genome sequence .txt file. Select "NGS: QC and manipulation > FASTQ Groomer" from the Tools menu. Next to File to groom, select the libraries uploaded in step 4.2.2. In Input FASTQ quality scores type, select the appropriate sequencing system. For Advanced Options, leave Hide Advanced Office selected. Select "NGS: QC and manipulation > Remove sequencing artifacts". Next to Library to filter, select the groomed files generated in step 4.2.3. Click "Execute". NOTE: Repeat these steps once or twice to ensure all C-tails are removed. Select "NGS: QC and manipulation > Clip adapter sequences". Library to clip: select the files generated in step 4.2.4. Library to clip: select files generated in step 4.2.5. Select "NGS: QC and manipulation > Filter by quality". NOTE: This tool selects reads based on quality scores. Library to filter: select the files generated in step 4.2.6. NOTE: With these settings, reads shorter than 20 nucleotides or with a quality score of 20 or less for 95% of the cycles are discarded. Adapt stringency settings to your experiment. Select "NGS: Mapping > Bowtie2"32. FASTQ file: select the library filtered for quality from step 4.2.7. Select the reference genome: select the Leptospira genome.txt file uploaded in step 4.2.2. Click "Execute" to align reads to the genome. Select "NGS: SAMtools > BAM-to-SAM convert BAM to SAM". BAM file to convert: Select mapped library from step 4.2.8. Select "NGS: SAMtools > Convert SAM to interval". Select dataset to convert: Select the SAM mapped library file generated in step 4.2.9. Select "Filter and Sort > Sort data in ascending or descending order". Sort dataset: Select the interval file generated in step 4.2.10. Select "Filter and Sort > Select lines that match an expression". Select lines from: select file with sorted reads generated in step 4.2.11.
the pattern: Enter the name of chromosome I as determined in step 4.2.1.3 (e.g., "ChrI"). Select "Join, Subtract and Group > Group data by a column and perform aggregate operation on other columns". Select data: select resulting file from step 4.2.12. Sort Dataset: Select file from step 4.2.14. Transfer the Galaxy data into spreadsheet files by copying and pasting the two columns from steps 4.2.16. and 4.2.17. into an Excel file. NOTE: The first column is the nucleotide coordinate of the transposon insertion site, and the second column is the number of reads at each insertion site. Identify the gene harboring the transposon using the nucleotide coordinate provided in the table. NOTE: For example, a transposon inserted at nucleotide #30718 of chromosome I is located in the LIC10024 gene, which spans nucleotides 29263-31539 in chromosome I.
Normalize all output/input ratios by setting the median ratio for each tissue in each animal to 1.0. A ratio of 1.0 is neutral, >1.0 is disadvantageous, and <1.0 is advantageous33. Compare output/input ratios to 1.0 (neutral fitness) by using the Wilcoxon rank test with P values <0.05 considered statistically significant. Creation of a library of transposon mutants in L. interrogans by conjugation requires a filtration unit, as shown in Figure 1. We recovered 100-200 transconjugants from each mating. The transposon insertion site is identified in each mutant by sequencing the PCR product generated by semi-random PCR that targets the end of the transposon and adjacent host sequences15 (Figure 2A). An example of results of the semi-random PCR is shown in Figure 2B. In most cases a dominant amplicon will be observed when the Deg1 and Tnk1 primers are used for the first round of PCR and the Tag and TnkN1 for the second round. However, due to the low specificity of the pentameric sequence (…N10GATAT-3') at the 3' end of the Deg1 primer, this primer will anneal at multiple locations throughout the leptospiral genome. If these sites are present near the transposon end, multiple PCR products may be obtained. When multiple amplicons are generated, they can be purified together from the PCR mix and sequenced directly; gel purification of each amplicon is not necessary because they will all contain the same sequence downstream of where TnkN1 primer anneals. On the other hand, PCR may fail if the nearest copy of the sequence targeted by the Deg1 primer is located at a great distance from the transposon end. If no PCR products are detected, the first round of semi-random PCR can be repeated with the Deg1 primer and Tnk2 primer, which targets the opposite end of the transposon. In this case TnkN2 and Tag would be used for the second round; the amplicon would be sequenced with the TnkN2 primer (Figure 2B). Alternatively, the first round of PCR can be done with the Deg2 primer, whose 3' end (…N10TCTT-3') targets a four- rather than a five-nucleotide sequence. Four different sets of primers can be used for the first round of PCR (PCR #1): Tnk1+Deg1, Tnk1+Deg2, Tnk2+Deg1, Tnk2+Deg2. When one set of primers does not work, use another set. If this second set also fails, use another one and so on. Spontaneous kanamycin resistant mutants are very rare, and arise at a frequency of <10-10 34. During the preparation of genomic libraries (Figure 4), a couple of steps can be verified. Shearing the DNA by sonication should be confirmed by electrophoresis of an aliquot in an agarose gel (Figure 5). When DNA is sheared correctly, DNA fragments ranging from 200 to 600 bp will form a smear in a 2% agarose gel. Before sending libraries for high-throughput sequencing, the generation of PCR products by nested PCR reactions must to be confirmed by agarose gel electrophoresis (Figure 6). After processing the sequencing reads following the protocol described here (section 4.2. ), the frequency of each mutant in the input pool and in all tissues is determined using the equation in section 4.3.3. The output/input ratio for each mutant in each tissue is calculated with the equation in section 4.3.4. Figure 7 shows an example of results obtained with the Tn-Seq approach. Alternatively, the MAGenTA tool can be used to process and analyze the sequencing data 31. Mutants with statistically significantly reduced and increased fitness were identified. Mutations in known leptospiral virulence genes caused reduced fitness, validating the Tn-Seq approach. Figure 1: Filtration unit used for conjugation. 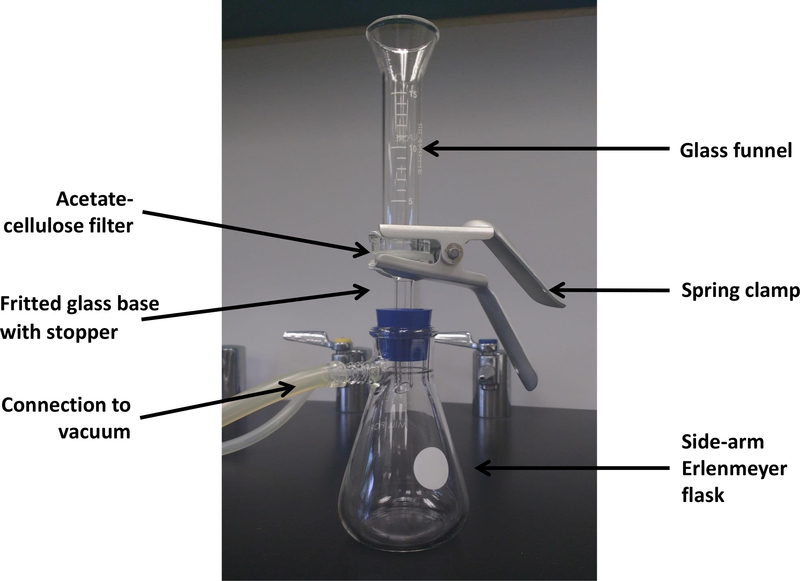 The filtration unit is assembled by inserting the stopper of the filter support into a side-arm Erlenmeyer flask, positioning the acetate-cellulose filter onto the base with sterile forceps, then placing the funnel onto the base, and securing the system with a clamp. The filtration unit is then connected to the vacuum system. Please click here to view a larger version of this figure. Figure 2: Identification of the transposon insertion sites. (A) Scheme showing annealing sites of semi-random PCR primers. Tnk1 and Tnk2 primers anneal close to the opposite ends of the transposon (Tn). Deg1 is a 35-nucleotide primer that contains a stretch of 10 degenerate nucleotides followed by the sequence GATAT at the 3' end. The first round of PCR (PCR #1) is conducted with Deg1 and Tnk1 or with Deg1 and Tnk2. TnkN1 and TnkN2 primers, used for PCR #2, anneal between the transposon ends and Tnk1 and Tnk2, respectively. The sequence of the Tag primer is identical to that of the 5' end of the Deg1 primer. (B) Example of agarose gel obtained after the second round of PCR with 14 transposon mutants (lanes 1 to 14). The first round of PCR was performed with Deg1 and Tnk1; the second round was done with Tag and TnkN1. Positive PCR is represented by "+" and a negative PCR by "-". "KmR" represents the kanamycin resistance cassette. Please click here to view a larger version of this figure. Figure 3: Flow chart for obtaining the output pool. On the day of challenge (day 0), each leptospiral mutant is counted by darkfield microscopy, diluted to the same density, and combined to form the input pool (details provided in section 2.1). Hamsters are challenged intraperitoneally with the input pool. In addition, three cultures were started with the input pool. On the day of inoculation (day 0) and when the cultures reach a density of ≈ 108/mL, the input pool and cultures are collected by centrifugation and stored as pellets at -80 °C until use (see section 2.3). On the endpoint day (day preselected to terminate the animals, e.g., day 4 after challenge), animals are euthanized; blood, kidney, and liver are collected and stored at -80 °C until use (see section 2.4). Please click here to view a larger version of this figure. Figure 4: Flow chart of the genomic library preparation. (A) DNA is extracted from blood, tissues or cultures following the protocol described in section 3.1. The red box represents the transposon (Tn). (B) The DNA is sheared by sonication into fragments between 200 and 600 bp. Further details are provided in section 3.2. 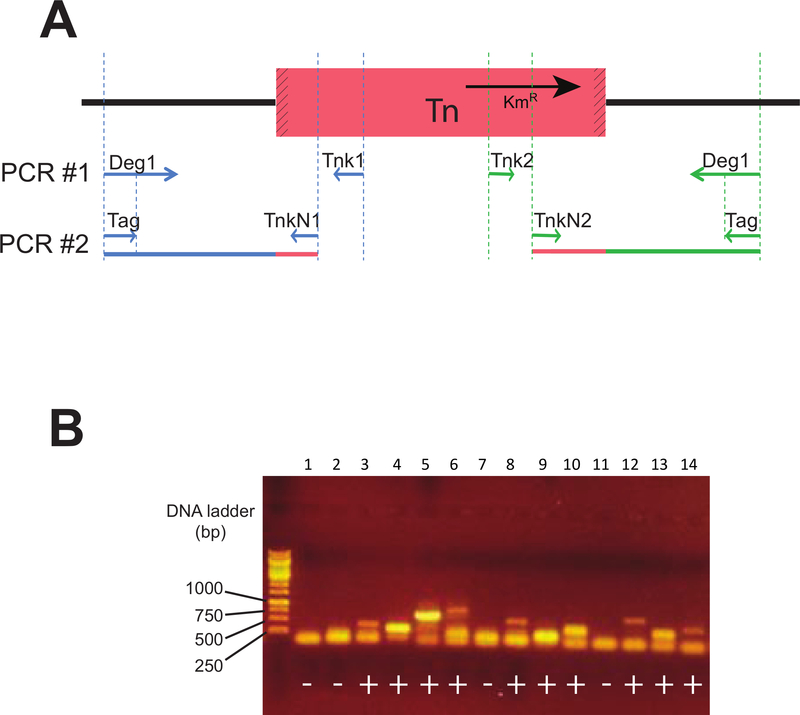 (C) C-tails (yellow boxes) are added to all DNA fragments with terminal deoxynucleotidyl transferase (TdT) as described in section 3.3 and Table 4. The genomic library is prepared for sequencing by nested PCR (D-E). The first round of PCR is performed with TnkN3 and olj376 primers specific to the transposon and the C-tail, respectively. See Table 3 and 5. Only fragments containing the transposon ends (red box) are amplified. Note: Use 3 times more olj376 primer than TnkN3 because all DNA fragments have C-tails. The second round of PCR is conducted with pMargent2, specific for the transposon end, and one indexing primer, containing a six-base-pair barcode sequence (in pink) allowing all samples to be multiplexed in a single sequencing lane. See Table 3 and 6. Both primers contain sequences necessary for binding the flow-cell during Illumina sequencing (green and purple box). (F) The resulting PCR products are cleaned, and then their concentration is measured as described in section 3.6. (G) All genomic libraries are pooled together; each library has a different barcode and (H) the pool is sent to the sequencing platform. Please click here to view a larger version of this figure. Figure 5: Sonication of DNA. DNA was purified from the livers of eight infected hamster (lanes 1 to 8), sonicated, and examined by electrophoresis in a 2% agarose gel. Sheared DNA is characterized by a smear in which the size of most of the fragments is between 200 and 600 bp. Please click here to view a larger version of this figure. Figure 6: Genomic libraries for high-throughput sequencing. Genomic libraries were prepared by ested PCR with DNA from the blood of eight infected hamsters (lanes 1 to 8) and examined by electrophoresis in a 2% agarose gel. The size of most of the PCR products is between 200 and 600bp. Negative control (no TnkN3 primer in PCR #1 mix, see Table 5) shows no amplification (not shown). Please click here to view a larger version of this figure. Figure 7: Fitness of mutants from Tn-Seq experiment. Fitness of a pool of mutants in hamster's kidney 4 days after challenge (adapted from Lourdault's study17). The output/input ratio of all 42 mutants was determined for each animal. Each mutant is named by the gene (lic) or the intergenic region (inter) the transposon is inserted into or the name commonly used in the literature. Each ratio is represented by a black diamond. The median of ratios (red line) was determined for each mutant and compared to 1.0 using the Wilcoxon rank test. The dotted line represents fitness of 1.0, which corresponds to neutral fitness. Mutants whose fitness is significantly affected are marked by asterisks: * P <0.05; ** P <0.01. Please click here to view a larger version of this figure. * Primer sequences in Table 3. Table 1: Identification of the transposon insertion site, semi-random PCR #1 mix. Table 2: Identification of the transposon insertion site, semi-random PCR #2 mix. Table 4: C-tailing reaction with terminal deoxynucleotidyl transferase (TdT). Table 5: Construction of genomic library, PCR #1 mix. Table 6: Construction of genomic library, PCR #2 mix. 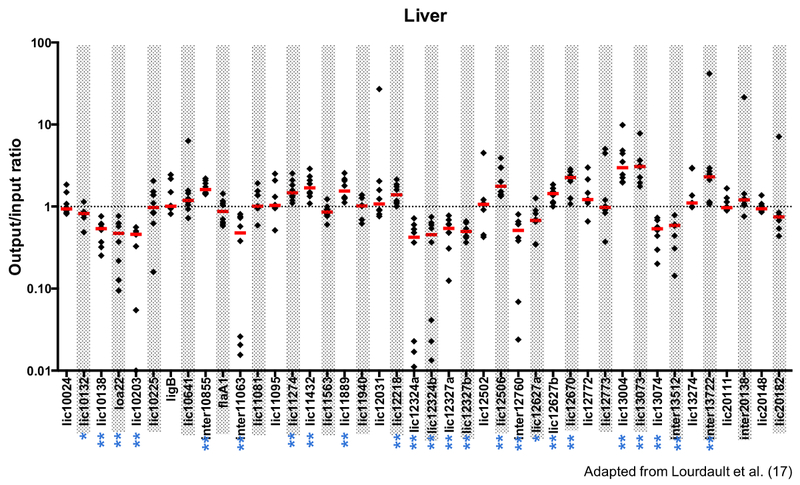 Although results from our pilot experiment for hamster challenged intraperitoneally with 42 L. interrogans mutants are presented17, we expect that larger pools of mutants can be screened by Tn-Seq. Because the frequency of transconjugants is low (100-200 transconjugants/mating), several matings are necessary to generate a sufficient number of mutants for large Tn-Seq experiments. Maintaining a large number of mutants in liquid cultures presents logistical challenges that must be addressed. Cultures can be incubated in deep 96-well plates. Culture densities can be monitored by optical density readings in a spectrophotometer set to 420 nm. The determination of the number of animals to use depends in part on the size of the input pool and must be determined by power analysis. For large-scale experiments, we recommend that the power analysis be performed in consultation with a biostatistician. Bottlenecks can impact the recovery of random mutants from the output pool. 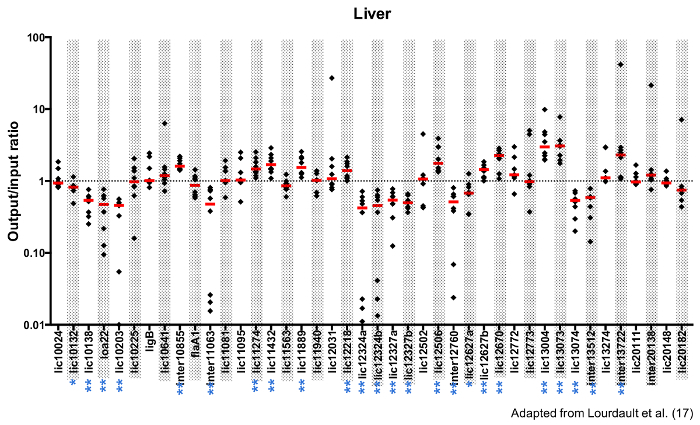 Although severe bottlenecks were not observed in our pilot study17 (Figure 7), large-scale experiments may be affected by random loss of mutants. Increasing the challenge dose by increasing the number of cells per mutant in the input pool will minimize the likelihood of bottlenecks35. The newly published Galaxy tool MAGenTA provides the necessary tool to assess bottlenecks and fitness31. Tn-Seq experiments planned for an alternative route of infection, other Leptospira strains, or other rodent models require additional considerations. If the kinetics of infection in the host species is not known or is not continuously exponential during the course of infection within each tissue to be examined, DNA should be obtained from culturing of the tissues rather than directly from the tissues. This additional step will minimize overestimates of mutant fitness due to detection of DNA from dead spirochetes. If the output pool is obtained from culturing the tissues, the input pool should be cultured to address effects of in vitro growth. We also recommend a pilot experiment with a small number of mutants to determine whether bottlenecks will be a concern and to aid the power analysis for large-scale experiments. Confirmation of altered fitness as determined by Tn-Seq will require testing of individual mutants in the animal model. Currently, each mutant must be sequenced individually prior to Tn-Seq to identify the mutant carrying the insertion in the gene of interest. However, if allele replacement in pathogenic Leptospira becomes easy, sequencing of individual mutants will no longer be necessary. Alternatively, transcription activator-like effectors have been successfully used to diminish lig genes expression in L. interrogans36. This technique could be used to down-regulate genes disrupted in mutants with altered fitness identified by Tn-Seq. When interpreting the Tn-Seq data, interactions between bacteria should to be taken into account. It is theoretically possible that a decrease in fitness could be due to competition between mutants rather than a direct effect of the transposon insertion. Additionally, an absence of change in in vivo fitness of a mutant in a pool could be due to cooperation between mutants. For example, a mutant that fails to produce an essential factor could be complemented intercellularly by production of the factor by other mutants in the pool. We observed an increase in fitness for several mutants, which may be a consequence of the reduced metabolic burden of no longer synthesizing proteins that are not essential for growth, as shown for Salmonella enterica37. This protocol can be used to identify genes involved in metabolism or survival under stressful conditions in vitro 38,39. For example, growing Leptospira in different conditions like high sodium chloride concentration, limited iron, and acidic pH could identify genes responsible for acidic survival or stress resistance. These in vitro experiments can also be performed with saprophytic strains such as L. biflexa strain Patoc I because this Tn-Seq method can be applied to all sequenced Leptospira strains. This work was supported by a Veterans Affairs Merit Award (to D.A.H.) and a National Institute of Health grant R01 AI 034431 (to D.A.H.). Master mix Phusion Thermo Scientific F531 Preparation of genomic libraries, step 3.4. DreamTaq Master Mix Thermo Scientific K9011/K9012 Identification of the transposon insertion site, step 1.2. Qubit 2.0 fluorometer Invitrogen Q32866 step 3.6. Qubit dsDNA HS assay kit Invitrogen Q32851/Q32854 step 3.6. Qubit assay tubes life technologies Q32856 step 3.6.
syringe U-100 with 26G x ½” needle BD vacutainer 329652 IP challenge, step 2.2.1. 3 mL Luer-Lok tip syringe BD vacutainer 309657 Cardiac puncture, step 2.4.2. 25G X 5/8” needle BD vacutainer 305901 Cardiac puncture, step 2.4.2. 25 mm fritted glass base with stopper EMD Millipore XX1002502 Filtration unit system, step 1.1.7. 25 mm aluminum spring clamp EMD Millipore XX1002503 Filtration unit system, step 1.1.7. 15 ml borosilcate glass funnel EMD Millipore XX1002514 Filtration unit system, step 1.1.7. 125 ml side-arm Erlenmeyer flask EMD Millipore XX1002505 Filtration unit system, step 1.1.7. Murray, G. L., et al. Genome-wide transposon mutagenesis in pathogenic Leptospira species. Infect Immun. 77, (2), 810-816 (2009). Adler, B., Lo, M., Seemann, T., Murray, G. L. Pathogenesis of leptospirosis: the influence of genomics. Vet Microbiol. 153, (1-2), 73-81 (2011). Marcsisin, R. A., et al. Use of a high-throughput screen to identify Leptospira mutants unable to colonize the carrier host or cause disease in the acute model of infection. J Med Microbiol. 62, 1601-1608 (2013). van Opijnen, T., Lazinski, D. W., Camilli, A. Genome-wide fitness and genetic interactions determined by Tn-seq, a high-throughput massively parallel sequencing method for microorganisms. Curr Protoc Microbiol. 36, 1E.3.1-1E.3.24 (2015). Troy, E. B., et al. Understanding barriers to Borrelia burgdorferi dissemination during infection using massively parallel sequencing. Infect Immun. 81, (7), 2347-2357 (2013). Wunder, E. A. Jr, et al. Real-time PCR reveals rapid dissemination of Leptospira interrogans after intraperitoneal and conjunctival inoculation of hamsters. Infect Immun. 84, (7), 2105-2115 (2016). Lourdault, K., Aviat, F., Picardeau, M. Use of quantitative real-time PCR for studying the dissemination of Leptospira interrogans in the guinea pig infection model of leptospirosis. J Med Microbiol. 58, 648-655 (2009). Coutinho, M. L., et al. Kinetics of Leptospira interrogans infection in hamsters after intradermal and subcutaneous challenge. PLoS Negl Trop Dis. 8, (11), e3307 (2014). Athanazio, D. A., et al. Rattus norvegicus as a model for persistent renal colonization by pathogenic Leptospira interrogans. Acta Trop. 105, (2), 176-180 (2008). Ratet, G., et al. Live imaging of bioluminescent Leptospira interrogans in mice reveals renal colonization as a stealth escape from the blood defenses and antibiotics. PLoS Negl Trop Dis. 8, (12), e3359 (2014). Gutierrez, M. G., Yoder-Himes, D. R., Warawa, J. M. Comprehensive identification of virulence factors required for respiratory melioidosis using Tn-seq mutagenesis. Front Cell Infect Microbiol. 5, (78), (2015). Gawronski, J. D., Wong, S. M., Giannoukos, G., Ward, D. V., Akerley, B. J. Tracking insertion mutants within libraries by deep sequencing and a genome-wide screen for Haemophilus genes required in the lung. Proc Natl Acad Sci U S A. 106, (38), 16422-16427 (2009). Gallagher, L. A., Shendure, J., Manoil, C. Genome-scale identification of resistance functions in Pseudomonas aeruginosa using Tn-seq. MBio. 2, (1), (2011). Slamti, L., Picardeau, M. Construction of a library of random mutants in the spirochete Leptospira biflexa using a mariner transposon. Methods Mol Biol. 859, (2012). Picardeau, M. Conjugative transfer between Escherichia coli and Leptospira spp. as a new genetic tool. Appl Environ Microbiol. 74, (1), 319-322 (2008). Lourdault, K., Matsunaga, J., Haake, D. A. High-throughput parallel sequencing to measure fitness of Leptospira interrogans transposon insertion mutants during acute infection. PLoS Negl Trop Dis. 10, (11), e0005117 (2016). Ellinghausen, H. C., McCullough, W. G. Nutrition of Leptospirapomona and growth of 13 other serotypes: Fractionation of oleic albumin complex and a medium of bovine albumin and polysorbate 80. Am J Vet Res. 26, 45-51 (1965). Johnson, R. C., Harris, V. G. Differentiation of pathogenic and saprophytic letospires. I. Growth at low temperatures. J Bacteriol. 94, (1), 27-31 (1967). Demarre, G., et al. A new family of mobilizable suicide plasmids based on broad host range R388 plasmid (IncW) and RP4 plasmid (IncPa) conjugative machineries and their cognate Escherichia coli host strains. Res Microbiol. 156, (2), 245-255 (2005). Vallenet, D., et al. MicroScope: a platform for microbial genome annotation and comparative genomics. Database (Oxford). bap021 (2009). Goodman, A. L., Wu, M., Gordon, J. I. Identifying microbial fitness determinants by insertion sequencing using genome-wide transposon mutant libraries. Nat. Protocols. 6, (12), 1969-1980 (2011). Miller, J. Spirochetes in body fluids and tissues manual of investigative methods. 22-23 (1971). Ristow, P., et al. The OmpA-like protein Loa22 is essential for leptospiral virulence. PLoS Pathog. 3, (7), (2007). Croda, J., et al. Targeted mutagenesis in pathogenic Leptospira species: disruption of the LigB gene does not affect virulence in animal models of leptospirosis. Infect Immun. 76, (12), 5826-5833 (2008). Haake, D. A. Hamster model of leptospirosis. Curr Protoc Microbiol. 12, 2 (2006). Giardine, B., et al. Galaxy: a platform for interactive large-scale genome analysis. Genome Res. 15, (10), 1451-1455 (2005). Blankenberg, D., et al. Galaxy: a web-based genome analysis tool for experimentalists. Curr Protoc Mol Biol. (Chapter 19), 11-21 (2010). Afgan, E., et al. The Galaxy platform for accessible, reproducible and collaborative biomedical analyses: 2016 update. Nucleic Acids Res. 8, (44), (2016). McCoy, K. M., Antonio, M. L., van Opijnen, T. MAGenTA; a Galaxy implemented tool for complete Tn-Seq analysis and data visualization. Bioinformatics. 1367 (2017). Kamp, H. D., Patimalla-Dipali, B., Lazinski, D. W., Wallace-Gadsden, F., Camilli, A. Gene fitness landscapes of Vibrio cholerae at important stages of its life cycle. PLoS Pathog. 9, (12), e1003800 (2013). Poggi, D., Oliveira de Giuseppe, P., Picardeau, M. Antibiotic resistance markers for genetic manipulations of Leptospira spp. Appl Environ Microbiol. 76, (14), 4882-4885 (2010). Pappas, C. J., Picardeau, M. Control of gene expression in Leptospira spp. by Transcription activator-like effectors demonstrates a potential role for LigA and LigB in Leptospira interrogans virulence. Appl Environ Microbiol. 81, (22), 7888-7892 (2015). Koskiniemi, S., Sun, S., Berg, O. G., Andersson, D. I. Selection-driven gene loss in bacteria. PLoS Genet. 8, (6), e1002787 (2012). Troy, E. B., et al. Global Tn-seq analysis of carbohydrate utilization and vertebrate infectivity of Borrelia burgdorferi. Mol Microbiol. 101, (6), 1003-1023 (2016). Ramsey, M. E., et al. A high-throughput genetic screen identifies previously uncharacterized Borrelia burgdorferi genes important for resistance against reactive oxygen and nitrogen species. PLoS Negl Trop Dis. 13, (2), e1006225 (2017).